Note: I have not personally invested in The Money Platform and this post is largely a write up of my ‘working notes’ to decide if I will invest. The Money Platform is a new peer-to-peer lending platform which connects investors directly with individual ‘pay day’ borrowers. Borrowers apply for loans between £250 and £1000 at 0.3% to 0.7% interest per day. These loans are then sold individually to investors via the platform. Loan terms are from 3 to 12 weeks and are non-compounding. Given the typical borrower and as there is no underlying security, these are the very highest risk loans and I would recommend P2P lending newcomers to be extremely careful. Expected Returns: 12% per annum (The Money Platform’s own estimate: link here). Who Are The Money Platform? The Money Platform launched in September 2016 and were members of the FCA’s incubator scheme, which gives support to innovative new Fintech businesses. According to Companies House, their parent company Gracombex LTD was incorporated in January 2015 and The Money Platform website a short while later in May 2015. The Money Platform stay under these limits, with the missed repayment fee of £15, max daily interest of 0.7% and a max repayment of 59% interest on a 12 week loan. Investors receive a proportion of the interest, with the rest going to The Money Platform as fees. The fees are 35% of interest, with the remaining 65% going to lenders. In my case I had no money deposited and it would not let me make an offer. I am not sure if you can make offers on several different loan terms with the same £250 for example. Is it Moral to Lend at Such High Rates? As interest is non compounding, the highest possible annualised interest rate for borrowers is the 3 week at 0.7%, which works out at 14.7% interest for the 3 week period. Assuming a borrower would repeatedly take these same loan terms + previously accrued interest over a year, this would theoretically cost 100% * ( ( 100 + 0.07 * 21 ) ^ (365/21) -1) = 985%. In practice you would hope that the loans would just be used over a single loan term to satisfy a short term pressing need. I did a little googling around for payday loan rates set by other companies, and many seem to stick to the maximum 0.8% legislated by the FCA. In this sense, if The Money Platform is giving some loans out at lower rates it is a step in the right direction. I was recently working on a personal project: an automated script that I wrote to identify and track peer to peer lending sites and monitor their ‘authority’ in google over time (you can see it in practice here). For this I had to manually categorise hundreds of websites that were being thrown out by the script, the vast majority of them payday lending sites. What I grew to dislike after looking at many of them was the method often used to target borrowers. A typical website homepage was a stock image of happy, carefree people enjoying music in the sun. In my mind this makes up a small proportion of the people who use payday lending sites. For me, a more fitting image would be someone who’s car had broken down and needed some emergency cash to fix it to get to work for the rest of the month. On the borrower’s section of The Money Platform, they’ve gone with a holiday image of a young couple relaxing on the wooden pier of an exotic beach. I am not sure how much I could enjoy my holiday if it was racking up interest of 0.7% a day! [The borrowers] are often excluded from mainstream financial services … often stuck in the middle of the non-approving bank and the rip-off loan shark. … The Money Platform does not lend to potential borrowers that have demonstrated financial difficult such as defaults, is currently in arrears or over their credit card limit. The Money Platform is a “clean lender”, it isn’t sub-prime or exploitative. Separately they estimate default rates at 7%, which they claim is “based on modelled default rates on historic loan data tested on The Money Platform’s current lending criteria”. I am no expert in pay day loan default rates, but 7% seems very low. First Period: 100 loans: 7 default, 93 pay back capital with 13.65% interest (42 days * 0.5% * (100% – 35% fees)). Annualising this with 1.0665^(52/6) gives an annual return of 74%. This is far higher than their 12% expected rate of return. The Lending Well charged 1% per day, The Money Platform charges a max of 0.7% per day. You would hope they have additional checks to target only lower risk borrowers (Good). As far as I can tell, The Lending Well paid investors just 0.033% per day (12% per year pro-rata’d on invested money), whereas The Money Platform pay investors between 0.2% and .45% per day (Good). The Lending Well had a compensation fund that paid investors if loans were 90 days late in repaying. This fund was intended to be paid for out of company profits. The Money Platform does not appear to have any protection against defaults. The Lending Well allowed investments of £10 per loan, The Money Platform has a minimum of £250 per loan (Bad). The lending well justified their high costs by the work they had to go through to check potential borrowers. Even with such huge fees they were unable to sustain a business. This may mean it is incredibly hard for The Money Platform to build a similar business in an even harder pay-day regulatory environment. This is a very new platform, and the lack of track record adds even further risk to what is a high risk investment proposition. There is no data on the website about historic default rates or how they came to the expecation of 12% returns. The smallest loan you can make is for £250, so spreading your money across 50 different borrowers would require at least £12,500 invested overall. Whats more, I imagine the smallest loan amounts will be the most highly sought over as investors look to diversify risk, so there may be an additional investment time lag or a downward pressure on rates. You are an active investor in The Money Platform or have been in the last 6 months. given the degree of risk involved with unsecured loans to people who are least able to repay them I simply do not think the returns to the lender will justify the risk. Add in the difficulty of making money in this market as evidenced by the problems experienced by existing pay day lenders (not to mention TrustBuddy which also failed to make a profit and suffered far higher default rates than this company predict) and this does not look a good place to risk your hard earned money. I tried to find some numbers on default rates experienced by TrustBuddy, as you mention Shaun it was a good example of the difficulties of lending in this area. 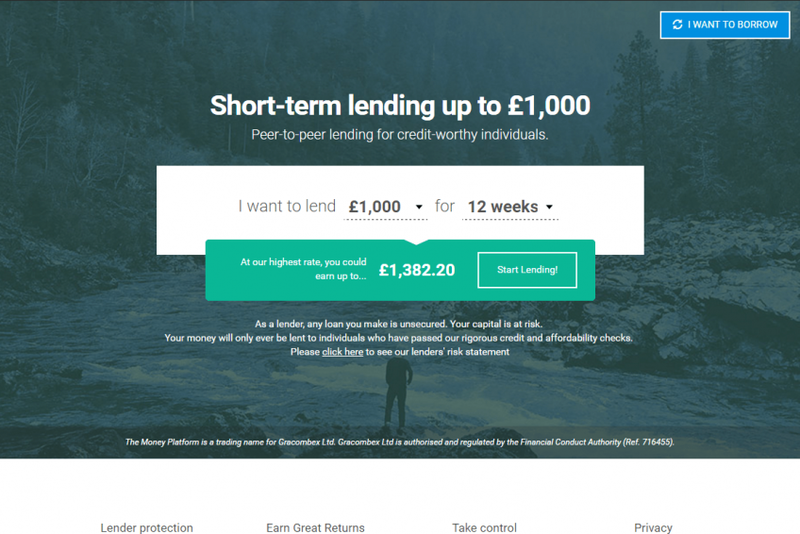 This article (https://www.lovemoney.com/news/23269/trustbuddy-peer-to-peer-lender-offering-12-returns-opens-up-to-uk-investors) sends a mixed message. TrustBuddy were saying they expect bad debt of 1%, but they also say they refer 20% of borrowers onto debt collection! If I make 100 loans 3 week loans at 0.3% per day on The Money Platform I would get back 4.095% interest at the end (100%*0.03*0.065) before any bad debts, so credit rating of borrowers will need to be outstanding for it to work. And that is ignoring their fraudulent activities! On a different note, as you don’t have a general query page, have you had a look at Crowd2Fund who are one of the few who are authorised to offer a IFISA? Have only just come across them so do not know anything about them yet. I haven’t had any experience with Crowd2Fund. Their website looks nice, but on first glance the returns on loans look quite low for the risk – for example this (https://www.crowd2fund.com/campaign/global-career-company-limited/building-the-workforce-in-africa) – stated as high risk, but just 9% interest. What do you think? In my case I am planning to wait until March to see who has the best IFISA and then use my allowance at the last minute. I signed up as a Lender on The Money Platform. I lent out £250 on a 90 day basis. to be told that my loan had been cancelled and that my money was being returned to my card. No interest was added but being kept by the company. The website looked at first glance like a genuine company, but from my own experiences this seems like a scam. Beware. DO NOT USE !!!!!!! Speaking as a borrower, I urge everyone to AVOID this [#####]. They [### may ###] lend YOUR MONEY to people that should not be eligible in order to satisfy their own profits. BE WARNED and invest with a [#####] company. THE MONEY PLATFORM should be [#####] ASAP. Editor note: As this 3rd party comment was very strongly written, I’ve edited a couple of the statements with a [#####] to include it on the site. My experience with this site is not very good. I have had several dealings with P2P and was actracted to this site by their high returns (greed). I have made 8 loans at £250 each of these loans 5 have been fully repaid with interest, however 2 have defaulted and one is one a payment plan with a debt charity. So in all likelyhood I will be out of pocket close to £400. 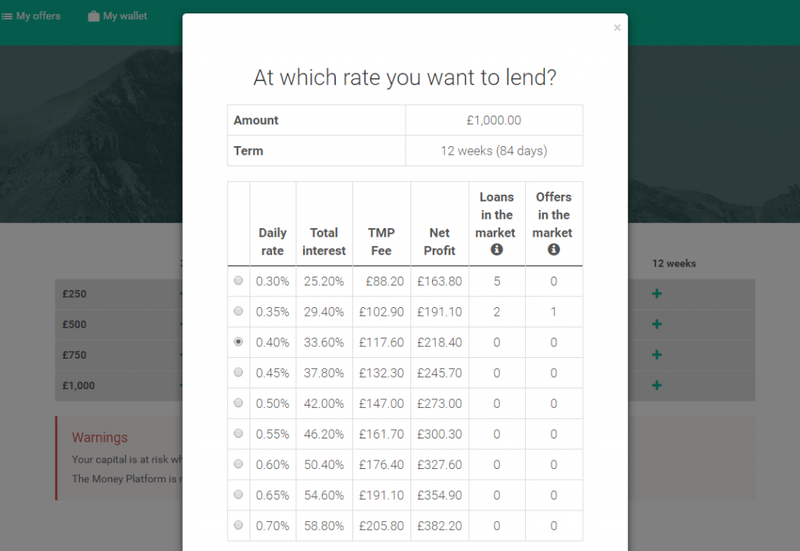 The stats on their website are misleading as they have such a long lead in time before a loan is considered to have defaulted that it makes their position look better than it is.